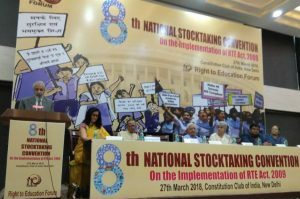 Upping the ante against the non-implementation of the Right of Children to Free and Compulsory Education Act, 2009, activists on the eve of 8th anniversary of the enactment (April 1) have given a call to make this a huge electoral issue in the next year’s (2019) Lok Sabha (Parliament) election. 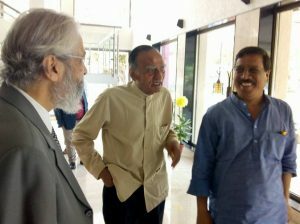 At its annual stocktaking convention (8th edition this year) on the status of the implementation of the RTE Act, 2009 held in New Delhi on March 27, The Right to Education Forum (RTE Forum), an amalgamation of various civil society groups, NGOs, groups and activists spread across the country with a national office in Delhi, almost all keynote speakers expressed disappointment with the way RTE is progressing in the country and called for peoples’ movement to ensure its proper and timely implementation. With the parliament elections just over a year ahead in 2019, activists gave a call to turn the lackadaisical approach towards right to education by the present government into a political issue so that no political party or government thinks ever that it can’t do without ensuring it. 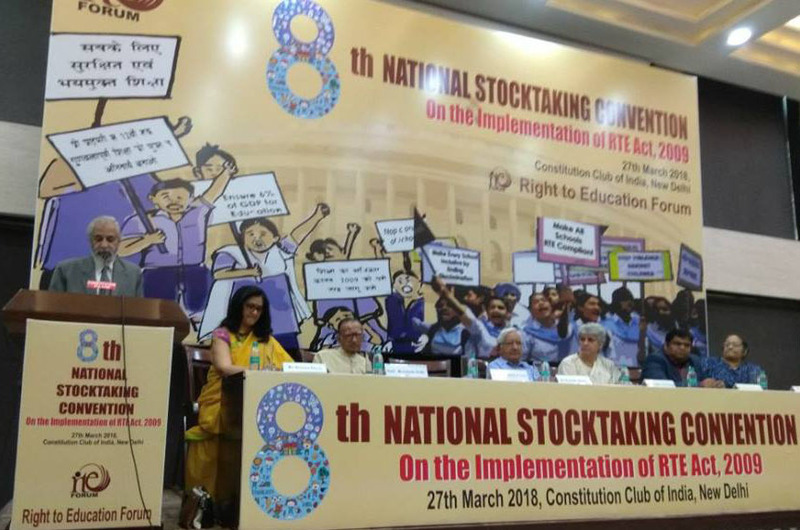 “A law is the only weapon in the hands of weak, disadvantaged and marginalized citizens and in today’s scenario when government schools are the only places to ensure education of their children, we are confident if such parents are made aware of what is going on with RTE, we’ll have countywide support,” said Ambarish Rai, National Convener, RTE Forum, adding that schools are the last check-post of democracy and only public places left for people to defend now. Rai said that the Forum will hold village-level awareness deliberations and build a momentum across the country in coming months for a mass campaign. He said that education is an issue very dear to every household or parent in the country and they need to be told that quality education is the right of their children and why should they get stressed out on fee issues and change of schools. “Groups like Pratham, which bring out ASER are helping low cost private schools mushroom in the country, which is nothing but commercialization of education and exploitation of poor in this country. People need to be educated how much bad and misconception this organization has spread and infected even the minds of policy makers against government school system,” he added. Speakers at the convention also lambasted government’s recent move at merger of SSA, RMSA and teacher training etc saying that instead of addressing the prevalent dichotomy between ‘project’ SSA and education department’s , it is diluting the real structures shouldered with the responsibility RTE implementation. Right to Education Act 2009, the landmark legislation arising out of first major amendment to country’s fundamental rights, which made elementary education compulsory and free for every child in India, enters its 8th year of enactment, there is a real danger of it being systematically withdrawn according to activists and top educationists in the country. This academic year (2018-19) will see the first batch of class VIII graduate under the new law after the RTE Act came into force on April 1, 2010 and covers the age group between 6 and 14—elementary education school years. Quoting CAG report of 2016, which was released recently, the draft report on the status of RTE released by RTE forum says, “20 of the 34 states & UTs fall below the national average of 8% compliance, 13 out of 34 states & UTs have less than 3% schools fully complying with the RTE Act and 18% states do not have even 1% of schools complying with RTE Act.” It may be mentioned Forum’s own reports of the past two years had maintained that only 10% of schools are RTE compliant. The CAG findings have in a way endorsed this claim. Sitting Supreme Court judge Justice Madan B Lakur, one of the four judges who held a presser against CJI recently, addressed the convention. He reminded that the right to education is a real right and people must start believing it, and demand it. Government is obliged both nationally and globally to provide for this right. The two amendments, extending teacher qualifications deadline to 2019 and doing away with ‘no detention policy’ (Bill No 166 of 2017 seeking to amend section 16 of the RTE Act and introduced in the parliament which is yet to be passed ), have caused a lot of furor among experts and educationists. Prof Poonam Batra, professor of education at Delhi University and one of the known authorities on teacher education in the country, questioned the ignorance of laws within the establishment. She reminded the government of the recommendation of Justice J S Verma Committee (No. 8 under Areas of Action No 6) which says, “As a matter of policy, the first professional degree/diploma in Teacher Education should be offered only in face-to-face mode” while tearing into official chest thumping on use the Swayam mooc platform and other online modes for teachers attaining teaching qualifications as stipulated by the RTE Act (sec 23). “Justice Verma committee recommendations are law of land, how can you get away with violations of laws?” she questions. Prof Batra also called for developing a separate cadre of elementary education teachers specifically dedicated to Right to Education Act. That after 2009, no discussion has taken place on the Act in parliament is seen as a non-serious approach of the government and parliamentarians on it. According to Prof R Govinda, former VC of NUEPA and one of the experts who wrote this Act, there is a negative feeling about the Act in the official machinery, which thinks that this law has been thrust upon them. “It is deplorable to see education, a means towards bringing equality, today becoming a tool of inequality within the society,” he says. The CABE sub-committee recommendation of starting vocational education at class III is another area, which evoked sharp criticism from experts. According to Prof Anita Rampal, professor at Delhi University and a well-known critic of no detention policy, till class 10, every child needs to be given education to broaden outlook, learn fundamentals, become well-versed with the knowledge framework, and tinkering with this universal held notion, is an assault on children rights. At the same forum, however NCPCR representative on RTE, Priyank Kanoongo, listed some valuable contributions that his commission has made to the monitoring process of the Act. He clarified that school closure (of government schools in name of consolidation) can only be done on recommendation of the local body or Panchayats. He also revealed that child labor rules of 2016 are now mandatory for schools and every head of school has to report a child absent for more than 30 days. Referring to DBT issue (Direct benefit transfer) where banks have been withholding money to beneficiaries for not having adequate balance in accounts, Kanoongo said that banks have been sensitized on the issue and the problem is getting over. He also talked about a manual being prepared by NCPCR for schools heads on various issues including safety and security. Left learning Prof Jayati Ghosh of the Centre for Economic Studies and Planning at JNU, New Delhi spoke of the invisible elephant while referring to inappropriate content changes being made in the text books. “Education is about making good citizens, increasing tolerance toward diversity and advancing societal values, but if content is not helping towards that end, then this talk of provisions and structures serves no purpose,” she added. Advocate Ashok Agarwal of Social Jurist expressed his fears that over emphasis on digitalization may add to child labor. He said our fundamentals have systematically corroded and there is a need to set that right while implying that schooling must be promoted. At the same time, Dr Yasmin Ali Haque, country representative, UNICEF said that the national achievement survey (NAS) has provided an opportunity to increase the momentum and grade-specific outcomes have provided a clue of solutions. She said involving children and knowing their perception and issues would provide some vital answers to present problems.